The integration into Linux is performed using an Open Source C library which has been extended by some important control features for scanCONTROL. An additional C++ library enables fast sensor integration of the entire functionality into a user-friendly API. This library is based on the GeniCam standard which is why the sensor can be controlled either via GeniCam commands or directly via the control parameters listed in the documentation. For integration support (e.g. trigger, container mode), also some example programs are available. Use on ARM embedded PCs (e.g. Raspberry Pi) is possible with restrictions. Each scanCONTROL sensor complies with the GigE Vision Standard (Gigabit Ethernet for Machine Vision) of the AIA (Automated Imaging Association). The standard is widely used in the image processing industry and is therefore supported by all conventional computer vision tools, ensuring fast and smooth integration into different image processing software packages - also for 3D evaluation. GigE Vision ensures optimum data security, perfect performance and short design-in times during implementation. GigE Vision is based on Gigabit Ethernet and offers a maximum transfer rate. Ethernet technology offers advantages such as long cable lengths without using repeaters/ hubs, and it permits the use of inexpensive network components. The GigE Vision standard provides an open framework for data transmission (e.g. 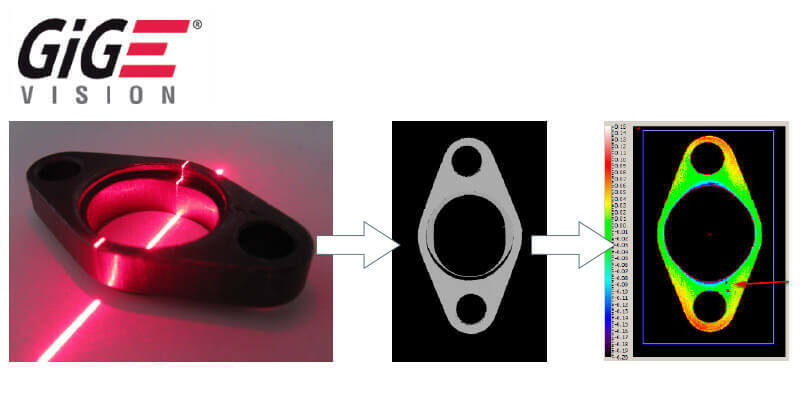 profiles, data sets) and control signals between the laser scanner and a PC. The infrastructure topology provides numerous opportunities for single and multiple scanner applications.